The travel jacket is available for both men and women as either a sweatshirt, blazer, windbreaker or bomber. The earliest campaign donors were able to snag items for anywhere from $89 to $119; new donors will pay between $109 and $129. The jacket is impressive in that it looks like an ordinary jacket, but contains an impressive number of features. Our personal favorite is a built-in inflatable neck pillow and eye mask. Who wants to have a neck pillow attached to their suitcase as they are rolling to and from the airport? Not cool. The Koozie Drink Pocket is also pretty sweet. How many times have you hit that airplane fold-down table with your knee and sent your red wine spilling all over your pants or the lap of the person next to you? The worst. 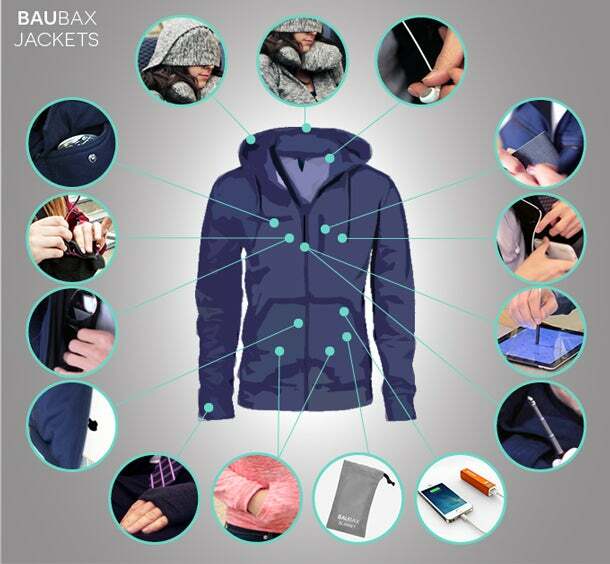 Have a wee look at the video below to see more of the innovative features of this travel jacket.